What do you know about papal saints? How many of them are you able to name? The Holy Father is canonizing two of predecessors on April 27, 2014. At that time there will be 83 saints who served the Church as the Roman Pontiff. That’s roughly a third of 266 bishops of Rome. The last of the canonized Pontiffs are: Saint Celestine V (r. 1294), Saint Pius V (1566-1572), and Saint Pius X (r. 1903-1914). We also await the Church’s discernment on 9 other popes who have been beatified, plus several who are at the beginning stages of the sainthood study process. 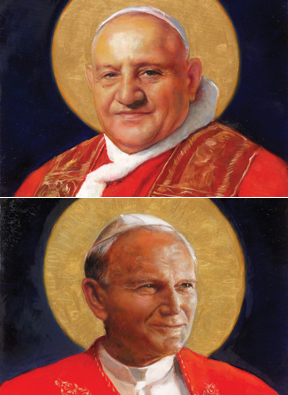 Christopher M. Bellitto has an article online over at St Anthony Messenger: “John XXIII and John Paul II: Our Newest Saints.” As a quick overview you ought to read. Some interpretative elements pertain more to Bellitto than to me but expand your knowledge.